linesandmarks.com just put up some images as a teaser for an interview we're doing later this Summer, including a few newish things of mine, and a little preview of Poetry is Useless. If you haven't been over there, it's a beautiful new site about drawing. Their opening salvo also includes Albrecht Dürer, Julie Mehretu, Charles Burns and Marcel Dzama. Pretty fine company, and a really nice expansive way of looking at this art form which is so close to my heart. Sometimes I make comics, sometimes I do illustration, sometimes I make diagrams and sometimes I make 'paintings'... but everything I do is drawing. Drawing is everything. If you click through to the interview preview page you get to move a little magnifying glass around on Adam and Eve Sneaking Back into the Garden to Steal More Apples. 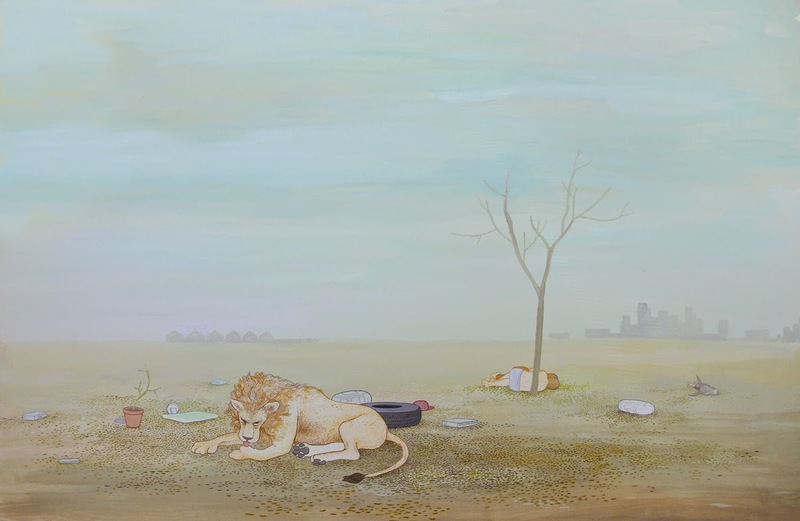 Most of my work is probably ripping off Burns a little bit, but here's a painting I did several years back inspired directly by Dürer's various takes on St Jerome and the Lion (which also might be the first time I depicted Adam and Eve – that's them by the tree).